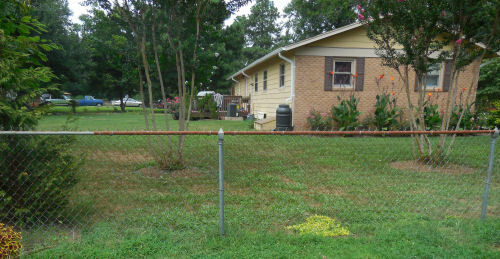 Our neighborhood is made up of 1/2 acre lots, many of which use chain link fences to divide the properties. While this type of fence is great to keep our German Shepherd dogs enclosed, it is not so great to look at. One of my projects for my test garden was to do something to hide the chain link fence that is very visible from our patio setting. This is one piece of chain link fence with no flower beds near it as it was last year. Further down this fence where my test garden starts, I started by planting forsythia bushes that my neighbor had dug up and discarded. My husband just used an axe to chop them into pieces and I planted the pieces of forsythia all along the fence where the upright supports are located. 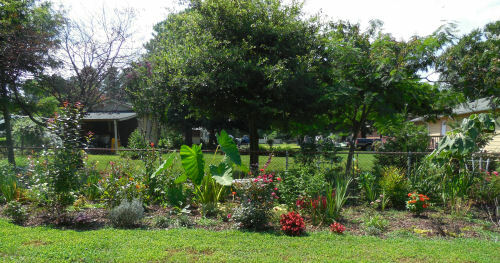 Then I dug up the sod by hand and planted some rose bushes and a few other plants along the border of the fence and put a bird bath in the center. It was only about 5 feet wide at this stage. 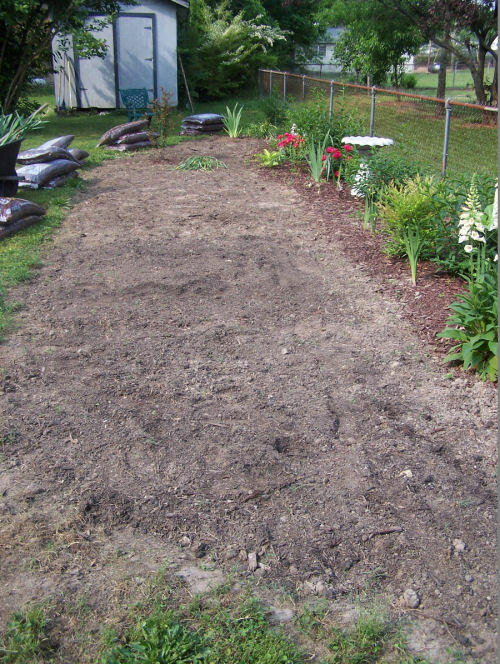 Next we tilled a long additional six foot wide swath of dirt and I dug up the sod. I planted annuals (lots of zinnias), sunflowers against the back border, hollyhocks, more rose bushes, a Washington Hawthorne Tree, Gladioli by the basketful, and many other perennials and annuals. A large elephant ear plant hides a lot of the fence and I found this growing in my compost pile! I loved the way our neighbor’s trees now seem like a part of our property! By next year, I don’t think we will see that fence at all. Update on my fence line. My row of forsythia bushes are large enough now to almost hide the whole fence line. The flowers come out first and then the leaves follow and go a great job of hiding the fence for the whole of the summer. What an amazing burst of spring time sunshine! See my tips for growing forsythia bushes here. What tips do you have for hiding your fence? I’d love to hear about them in the comments below. 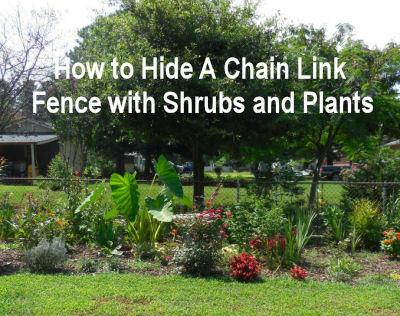 I am doing a similar fence-hiding project with forsythia, perennials, and annuals & this is very encouraging. Thank you for photos and details.